If you're just getting started in the world of quality improvement, or if you find yourself in a position where you suddenly need to evaluate the quality of incoming or outgoing products from your company, you may have encountered the term "acceptance sampling." It's a statistical method for evaluating the quality of a large batch of materials from a small sample of items, which statistical software like Minitab can make much easier. Basic statistics courses usually teach sampling in the context of surveys: you administer the survey to a representative sample of individuals, then extrapolate from that sample to make inferences about the entire population the samples comes from. We hear the results of such sampling every day in the news when the results of polls are discussed. The idea behind acceptance sampling is similar: we inspect or test a sample of a product lot, then extrapolate from that sample to make an inference about whether the entire batch is acceptable, or whether it needs to be rejected. You can see why this is useful for safeguarding quality. 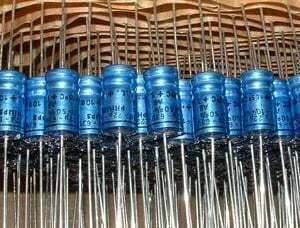 If you work for an electronics manufacturer that is receiving a shipment of 500 capacitors, inspecting and testing every one will take too much time and cost too much money. It's much more efficient to examine a few to determine whether the full shipment is ready to use, or if you should send the lot back to your supplier. But how many do you need to look at? Acceptance sampling will help you determine how many capacitors to examine, and how many defectives you can tolerate and still accept the shipment. But it's important to remember that acceptance sampling won't give estimates of quality levels, and because you're inspecting items that are already complete, it doesn't give you any direct process control. Acceptance Sampling by Attributes, or by Variables? 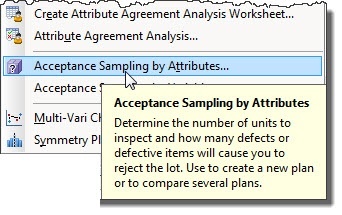 If you want to use acceptance sampling to evaluate a batch of products, you first need to decide which method is best for your situation: acceptance sampling by attributes, or by variables. Acceptance sampling by attributes assesses either the number of defects or the number of defective items in a sample. You might tally the total number of defects, in which case each defect in a single item with multiple defects is counted. Alternatively, you can count defective items, in which case the first problem makes an item defective, and you move on to evaluate the next item in your sample. In Minitab, you can choose Stat > Quality Tools > Acceptance Sampling by Attributes to either create a new sampling plan or to compare various plans. Attribute plans are generally easy to carry out: you randomly select a specified sample of n units from a lot of N units. If there are c or fewer defectives, accept the lot. If there are more than c defectives, reject it. For example, suppose you're receiving 10,000 transistors. You will inspect 89 of them. If there are 0, 1, or 2 defective transistors, you can accept the shipment. But if the sample contains more than 2 defectives, you'll reject the lot. 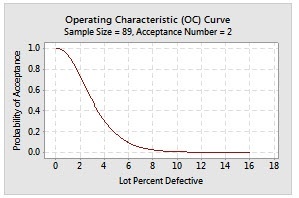 Acceptance sampling by variables is based on quality characteristics you can measure. For example, you might measure the length of the leads on capacitors, resistors, or other electronic components for circuit boards. In Minitab, you select Acceptance Sampling by Variables - Create / Compare to either devise a new sampling plan or to contrast different possible sampling plans. After you've collected data according to your variables plan, you need to calculate the mean, standard deviation, and Z value using those measurements. Just select Acceptance Sampling by Variables - Accept / Reject in Minitab to do those calculations and make a determination about the batch your sample came from. One thing to remember about variables sampling plans is that only one measurement can be examined per sampling plan. So if you need to assess the lead length of sample resistors as well as their performance, two separate sampling plans are required. However, variables sampling plans require much smaller sample sizes than attributes plans. Rejecting a good-quality batch, also known as producer's risk, or a. Accepting a poor-quality batch, also known as consumer's risk, or b. When you use Minitab for acceptance sampling, the software graphs an operating characteristic curve (OC curve) to quantify these risks. That graph illustrates the probability that a lot containing a certain fraction of defects or defective items will be accepted. In this graph, based on a sample of 89 items, there's a 50% chance of accepting the batch when 3% of it is defective, but if the percent defective is 9%, there's only a 10% chance of accepting the batch. In my next post, I'll go through an example of acceptance sampling by attributes.